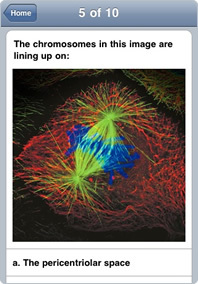 Are you learning about mitosis for a high school or college level course? 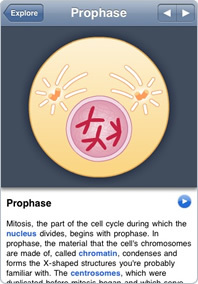 Take an interactive guide to mitosis with you on your iPhone or iPod touch! In Mitosis, you'll learn about the process of cell division by directly interacting with the cell. You'll have a glossary of relevant definitions at your fingertips, and you can listen to a recording that describes mitosis while you follow along in the text. 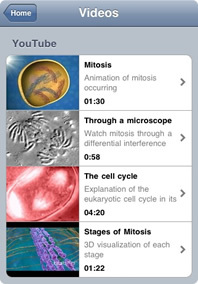 Best of all, Mitosis is a free app for your iPhone or iPod touch. Touch the screen to usher a cell through mitosis. Take an interactive quiz to test your knowledge. Browse a collection of educational resources. We're building a platform that helps students learn with interactive content. How can we make future applications better? © 2009, 2010 Standard Nine Inc. All rights reserved.